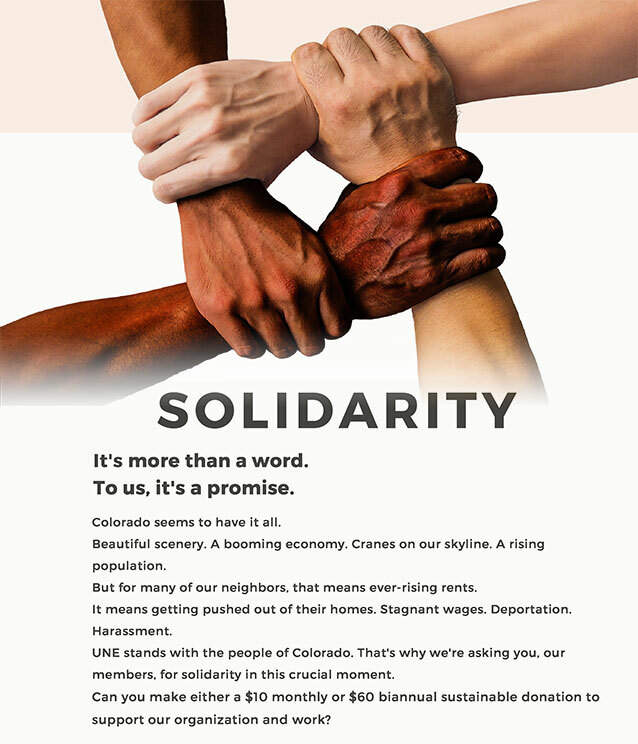 UNE, in partnership with 9to5 Colorado and Colorado Homes for All, are working with Senator Julie Gonzales on repealing the statewide ban on rent control – so our local communities can create their own solutions! In 1981, Colorado passed a law that prohibited local governments from having the authority to regulate the cost of rent. Allowing for local governments to be the decision makers around the cost of rent would allow for Colorado for significantly decrease the current disparities for cost of living. The proposed Local Control of Rents legislation would repeal the current state statute which prohibits Colorado from regulating rent, and grant authority to local governments to determine how regulated according to the local cost of living. “Whatever the policy, a city could tailor its approach to its specific housing market. Denver could craft laws to slow gentrification and Telluride could work to preserve worker housing,” shared Andrea Chiriboga-Flor of 9to5 Colorado. United for a New Economy (UNE) envisions vibrant, strong communities where ALL community members have a voice in the decisions that impact them, access to affordable, dignified housing, thriving neighborhoods, and a voice in building an economy that works for everyone. Join us in uplifting our neighbors and families in the ongoing effort towards housing justice for all. Become a Solidarity Member for less than 35¢ a day – click here!